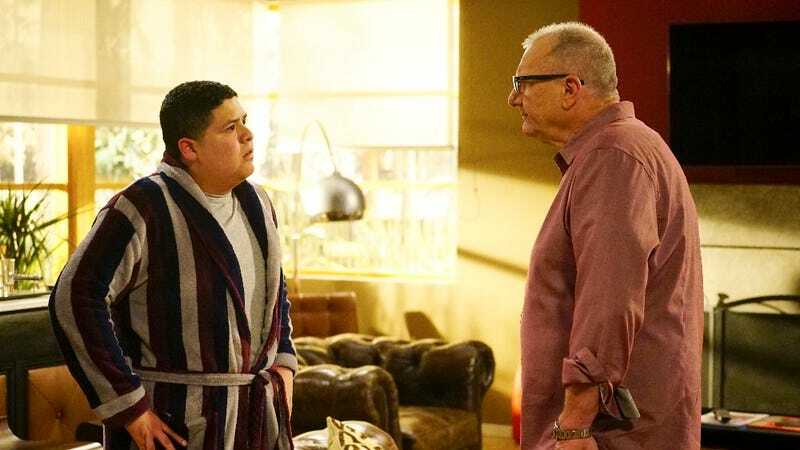 For the majority of the eighth season, Modern Family has been vaguely structured around the story arc of Luke and Manny graduating from high school. It’s hardly dominated the season, as the show has a tendency to just insert mentions of where these characters are in their lives in a slapdash fashion, but it has been a present theme. We’ve watched as Manny navigated one of his first parties, and as Luke secured a job and started taking steps towards adulthood and all the responsibility that comes with it. So, it makes sense that all of this was leading to graduation day, and the moment when Manny and Luke finally start to move away from their families, and for the most part “The Graduates” is a finale that fits in with this season’s general upswing in quality from last season. I say “for the most part” because “The Graduates” still suffers from a problem that’s been persistent throughout the eighth season. Many episodes have felt overstuffed or lacking any sort of narrative cohesion; more a collection of unrelated scenes and sketches than a tight half-hour sitcom episode. This season’s finale is no different. It’s not necessarily overstuffed, but it does lack a certain focus. While Manny and Luke’s graduation acts as the climactic scene, and there’s plenty to love about it and the subsequent congratulations that happen afterwards, most of what comes before it fails to hit the mark. It’s a shame too, because all the events leading up to the graduation focus on the parents and how their feeling leading up to the big moment, which should be great for finding plenty of dramatic and comedic material. But Modern Family never quite finds the right tone. The main story involves both Alex and Haley attempting to make Phil “all cried out” so that he doesn’t embarrass Luke like he did them at their graduation when he wept the whole time. So, they put together a video, complete with sappy music, that runs through a bunch of old photos of Luke. Sure enough, being the emotional man he is, Phil completely breaks down. It’a a fine enough way to poke fun at Phil, who is overly emotional a lot of the time, but it’s hard not to be a bit frustrated by the result. In essence, the treatment works and Phil doesn’t cry at the graduation, and it feels like a wasted opportunity rather than a solid punchline to an episode-long joke. Phil’s, and arguably the show’s, best moments are when he’s vulnerable, and the finale robs us of that. Emotionless Phil is not a version of Phil I ever want to encounter again. Similarly, the appearance of Manny’s father Javier, and the subsequent night spent out drinking and hitting up strip clubs with his son, is rather underwhelming. Javier is a character that’s hardly ever mentioned, his influence on Manny’s life practically nonexistent, leaving his presence in this episode feeling like more of a distraction than anything else. Still, his involvement in the story is a necessary evil so that Manny and Jay can finally get their moment of genuine connection. After Jay helps Manny track down his lost cap and gown, and clearly shows that he’s a bit hurt by the sudden appearance of Javier, the two get to share the scotch Jay has been saving for this moment, when Manny would get his first of many diplomas. The gesture in and of itself would be enough. For Jay, sharing a drink is something truly meaningful, a signal of respect for Manny and the man he’s on his way to becoming. But “The Graduates” goes just a bit further and allows Manny and Jay to actually share some kind words, with Manny essentially thanking Jay for being the father he never really had, and Jay thanking him for granting him another son that he didn’t even know he wanted. These two, despite their difference, have learned a lot from each other and enriched each other’s lives, and it shows in this small moment over a shared glass of scotch. While much of the finale shoots for the sentimental, the story involving Cam and Mitchell learning about the principal’s suggestion that Lily skip a grade is filled with laughs. The whole plot is essentially one long running joke about how Cam and Mitchell have always assumed Lily was weird or peculiar, only to find out that she’s excelling academically and socially. The story moves from one parental revelation to another, as Cam and Mitchell reckon with the fact that Lily is gifted, super popular amongst her classmates, and apparently loves La Dolce Vita. Who knows how Modern Family will follow through with some of these character details, but for now it’s nice to see Lily being given a more substantial storyline, something that will surely be necessary as the other “kids” begin to age. All in all, “The Graduates” is a fitting finale for this season of Modern Family. The show is never going to hit the highs of its earlier seasons anymore, but this one was also a marked improvement on the last. For all the shenanigans worthy of an eye roll, and the messy plots that couldn’t be bothered to tie anything together, this season also had its fair share of heart and charm. Here’s hoping that as Luke and Manny adapt to their new lives, Modern Family is able to adapt as well. Alex was conceived in the Disneyland hotel. This is a thing we all know now. As always, thanks for reading along all season! With Modern Family already renewed for two more seasons, odds are I’ll be back next year to navigate the show heading into its golden years. Here’s hoping it’ll all be worth it!